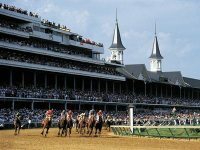 Known as the 'Most Exciting Two Minutes in Sports', the Kentucky Derby is the highlight of the American horse racing calendar and the first leg of the famous Triple Crown, the other races being the Preakness and the Belmont Stakes. It is one of the oldest races in the US, and is held every year at Churchill Downs, Louisville. Visitors to the Derby will be able to enjoy traditions like mint juleps, large extravagent hats and bold, trendy outfits, all the while gawking at the famous faces in Millionaire's Row. Advance tickets are available from the Churchill Downs website, as the event always sells out.